Hoboken is a city in Hudson County, New Jersey with a brilliantly rich history. This magnificent city has grown immensely over the years, which can largely be attributed to its proximity to Manhattan. Hoboken is part of the New York Metropolitan Area and is the site of Hoboken Terminal, a major transportation hub for the region. The city is located right on the Hudson River waterfront and has been an integral part of the Port of New York and New Jersey. Hoboken has become a prime location for those who want to live in an area that provides easy access to New York City, but do not wish to actually reside in it. The scenery of the Hoboken waterfront is unbeatable for a Hoboken Wedding Photographer. There are also many other venues that are perfect for taking the perfect shot of a couple as they embark on their journey of life together. In my many years as a Hoboken Wedding Photographer, I have had the privilege of taking photos of married couples at a slew of beautiful venues. I’ve listed some of the best I have worked in below. Kolo Klub - Kolo is Czech for bicycle and, despite the fact that the only bicycle visible at this great joint is the one in the logo, it is a clear signal that Kolo Klub is different from the competition in a fantastic way. This exciting salon space has great activities that you’ll love and is an excellent space for wedding photography. There’s a certain rustic quality to the salon, and the furniture helps give visitors and easy feeling of relaxed bliss. The cocktails are fantastic, with some of the most authentic master mixers calling the bar at Kolo Klub home. They also host a variety of private events, including weddings. Their 4, 000 square foot space can easily accommodate as many guests as you might want and the turn of the century furniture will give an authentic feel to your wedding photos that you won’t easily find elsewhere. Barsky Gallery – Barsky Gallery is a lofty gallery with captivating interior décor and original contemporary art adorning its walls. The levels of sophistication at this gallery are unmatched. If you’re the kind of person who enjoys watching an artist express themselves through a variety of mediums then you’ll feel right at home here. The wonderful works of art at the gallery will present an incredibly beautiful backdrop for whatever event you might want to host, including a wedding. Space isn’t an issue at all, whether you only want an intimate reservation for two, or a cocktail reception for 60 guests. You can also either choose from the gallery’s list of associated caterers or bring your own everything. This 110 square foot space on the ground floor a factory building in Hoboken is an ideal location for an contemporary art themed wedding and provides countless opportunities to take the perfect shot. Be sure to check it out when you have the time. Room 84 – Room 84 is set where the popular Bar None used to be on 84 Washington Street. This intimate bar setting offers a plethora of great features that you would want for your private wedding event. With an intimate layout that includes private seating and lounge areas, holding your reception will feel great. Some people just want their wedding reception to feel like the party it’s supposed to be. Room 84 makes that and much more a reality. Their version of bottle service allows patrons to customize their table selections in order to accommodate the different tastes of their guests. The LED lighting throughout the space, coupled with the Media Wall behind the bar will set the background mood perfectly for a glitzy and upbeat wedding photo. The acoustics are almost literally out of this world, allowing you to converse without having to destroy your lungs and voice box. If you want an even greater sense of privacy and intimacy, they also lease out a private room for more exclusive gatherings. If you want your wedding pictures to reflect your youth and the possibilities lying ahead of you and your significant other as a young couple, Room 84 allows you to say it in style. The W Hoboken – The New Jersey installment of the W Hoboken group of Hotels opened its doors to the public to skepticism and pessimistic outlooks on its future in the area. These hotels are known to be expensive and exclusive, after all. However, the W Hoboken hotel on the Jersey waterfront has thrived, much to the chagrin of its naysayers. This isn’t a fluke. The hotel offers proximity to the train, absurdly low prices, given the quality and reputation of the facilities, and a stunning view of the Manhattan skyline and the Hudson River. The famous Living Room is a great place for wedding receptions, cocktails, and vibrant conversation. The tasteful furniture and interior décor in the many rooms and private spaces of the hotel will lend an air of sophistication to your wedding photos that you will be hard put to find elsewhere. Every aspect of the hotel screams chic. There are many other great spots and venues all around Hoboken, such as the Crystal Plaza. Whatever kind of theme you’re looking to attach to your wedding, you’ll find a venue to match it and bring it out in a way like no other. This picture shows a Hoboken couple who began their relationship in this blooming city. I took the picture of the pair as they walked along one of the city’s picturesque piers, with the New York City skyline hanging majestically like a full wall painting in the background. The skyline shines brightly under a blue sky while fluffy white clouds float among the tops of buildings that reach up toward the sun. 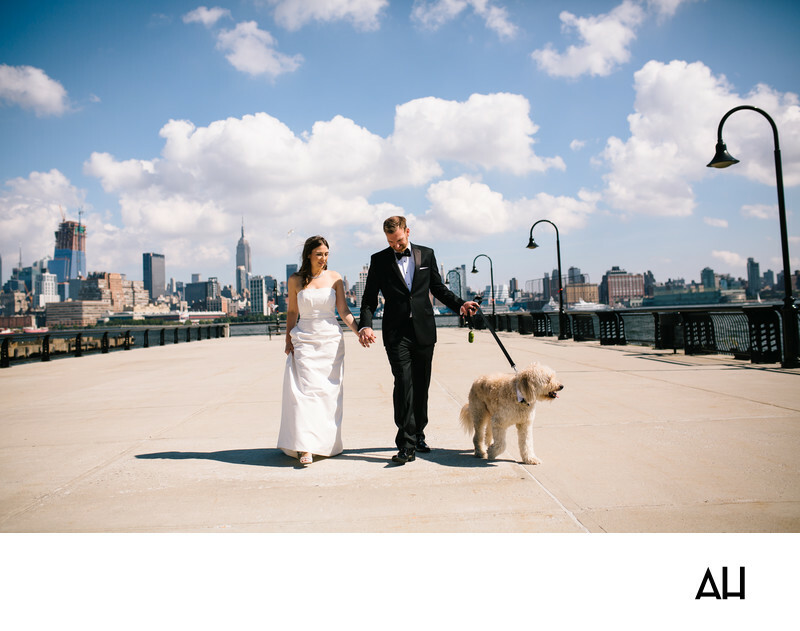 The bride and groom are alone on the pier, aside from their faithful dog, Goldendoodle. The groom is dashing in a black tuxedo with a black buttoned white dress shirt and a black bow tie. The bride wears a gorgeous strapless, white, satin gown. The dress is adorned with a simple jeweled necklace and the bride wears her hair down, allowing it to blow in the gentle river breeze. As they walk, the shadows of the couple seem to become one, symbolic of their union in marriage.